Coca-Cola Canada is very serious about obesity in this country, you may recall back in April they launched a campaign enlisting Canadians to help fight the medical condition. The campaign included investments in active, healthy living programs as well as the launch of a national advertising campaign. The first commercial in the campaign outlined Coca-Cola Canada’s ongoing efforts to educate people about its products, the numerous beverages and package choices it offers and its longstanding support of programs that inspire active healthy lifestyles. It also encouraged people to be mindful that all calories count in managing weight, including those in Coca-Cola Canada’s products and in all foods and beverages. Earlier this month, The Coca-Cola Company outlined its global business commitments to help fight obesity: 1) Offer low- or no- calorie beverage options in every market; 2) Provide transparent nutrition information, featuring calories on the front of all of our packages; 3) Help get people moving by supporting physical activity programs in every country where we do business; and 4). Market responsibly, including no advertising to children under 12 anywhere in the world. 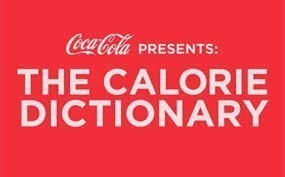 They are now launching the next phase of the campaign, this one is called ‘Calorie Dictionary,’ (see video above) which is making its global debut here in Canada on major networks across the country.